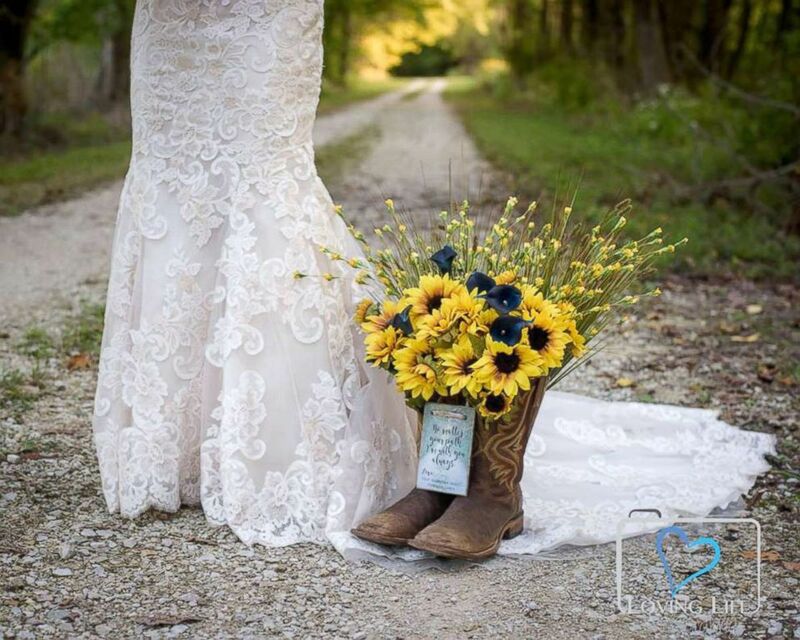 In a lace-embroidered white dress, holding a clutch of yellow sunflowers and surrounded by family and friends on her wedding day, a beautiful young bride stood poised last month in a bucolic, green park. “It’s the day you dream about when you are little: You found the man of your dreams and you’re going to marry him,” Jessica Padgett told ABC News. The only person missing from the long-planned ceremony was her groom, the love of her life, who had been killed by an alleged drunk driver last fall. 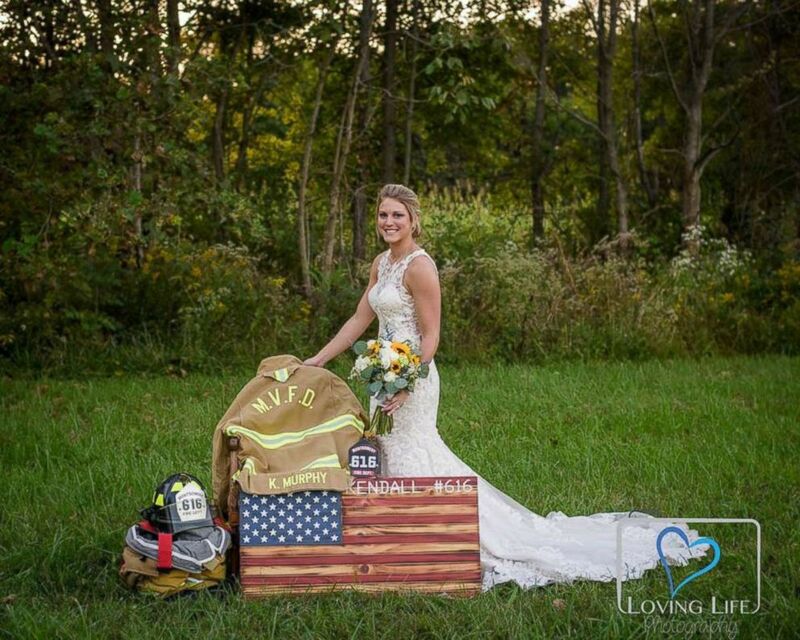 Somehow, Padgett, 25, who was set to marry a volunteer firefighter named Kendall Murphy, 27, found the strength to celebrate their happiness in the midst of her pain. Her plan was as unexpected as it was endearing. Jessica Padgett at Glendale State Park in Montgomery, Indiana, Sept. 29, 2018. Last fall, Murphy was responding to an accident scene when he was struck by a Dodge Ram pickup truck, according to local authorities. Like Murphy, the pickup truck’s driver, firefighter Colby Blake, 26, was responding to the accident scene. Unlike Murphy, Blake had apparently been drinking. Jessica Padgett standing by Kendall Murphy’s firefighter gear at Glendale State Park, Sept. 29, 2018. Blake admitted to police at the scene that he had six drinks and was talking on his cell phone prior to the crash, according to an accident report. Murphy died at the scene. Blake was charged with causing death while operating a motor vehicle, according to ABC News affiliate WTHI. Blake entered a plea of not guilty at a preliminary hearing. His case remains pending. Padgett was at Murphy’s house that night, doing some wedding planning, and when she returned home she got the news. “I remember falling out of my bed numb from head to toe when I heard the news,” she said. “I felt like someone was playing a dirty joke on me like I was having a complete nightmare." A third-generation firefighter, Murphy grew up in two families: his biological family and his firehouse family. “I’ve known him all his life,” Showalter said. “He grew up with my son. They were just like brothers. They joined the fire department on the same day," Showalter told ABC News, his voice cracking as he recalled the awful day. 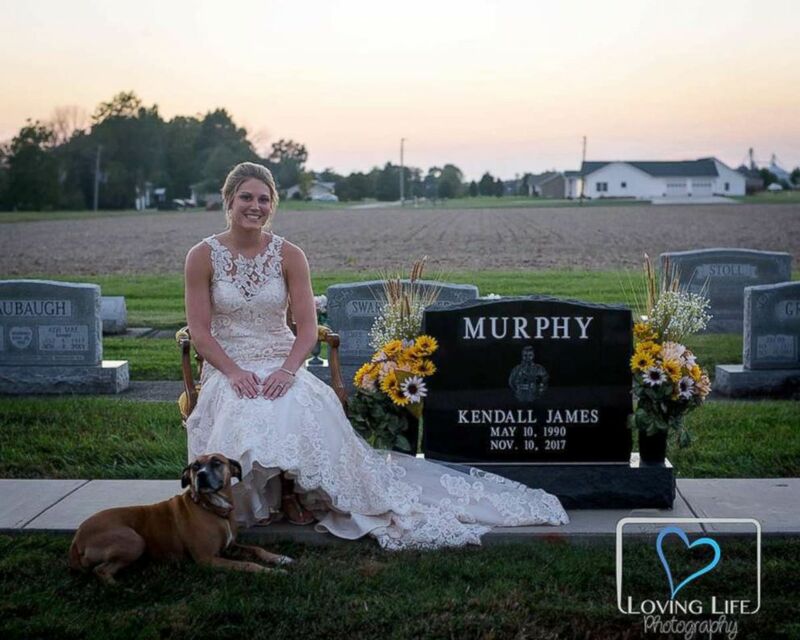 Jessica Padgett at Kendall Murphy’s tombstone with his dog at Providence Mennonite Church grave site in Montgomery, Indiana, Sept. 29, 2018. This is the finale of us. I wanted to celebrate it, even if I don’t get to walk down the aisle and say I do. 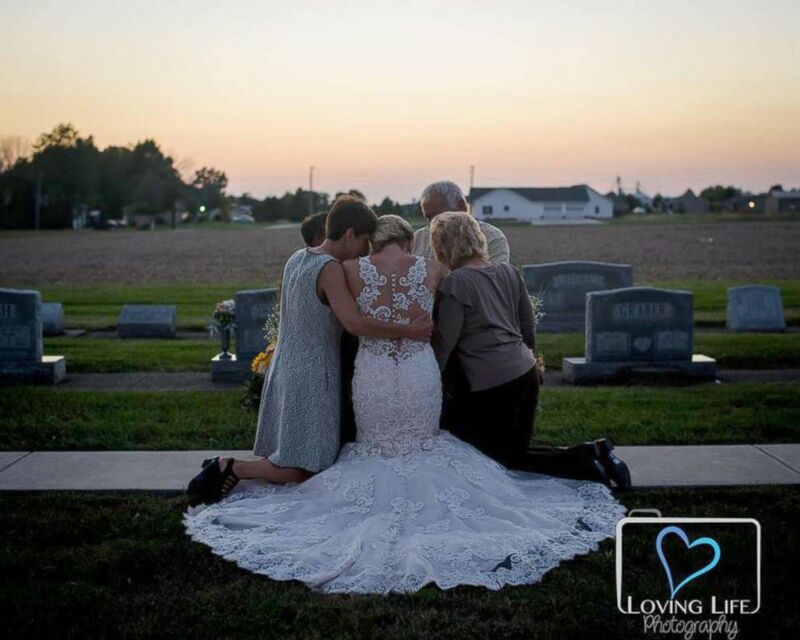 Jessica Padgett with her family hugging at Kendall Murphy's tombstone Providence Mennonite Church grave site, Sept. 29, 2018. Padgett first met wedding photographer Mandi Kneep when Kneep shot the couple’s engagement photo shoot last fall, in a green park within the Glendale State Fish and Wildlife area, an 8,000-acre state park preserve about 100 miles south of Indianapolis. The photographer and her subject got along well, and made plans for Kneep to shoot the couple’s wedding as well. 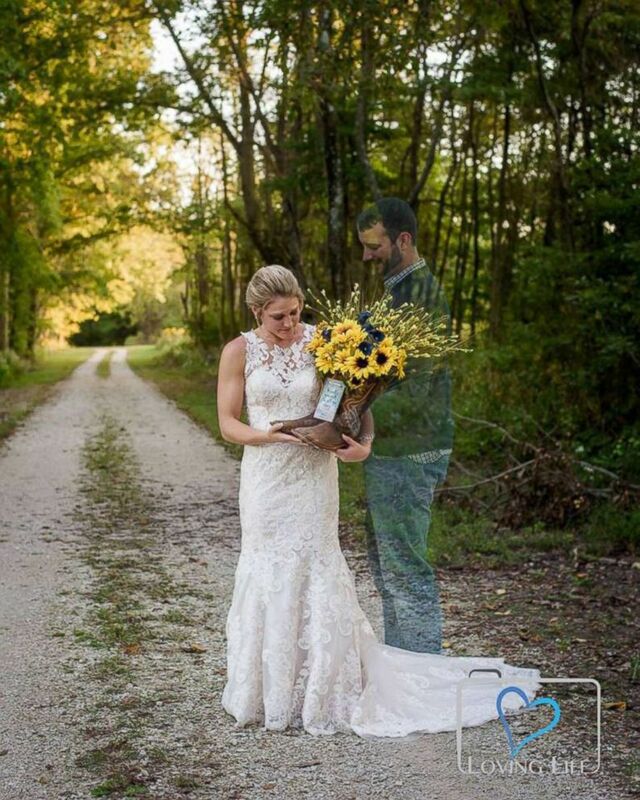 Shrugging off her grief and determined to memorialize the man she loved and lost, Padgett returned last month to the same park, made up as a bride, with her bridesmaids lined up, and their with their families and other guests in tow. The American flag and Murphy's firefighter uniform, hat and boots stood in his place as Padgett smiled, standing alone. No bridal detail had been overlooked. At 4 p.m. Padgett was in her bridal suite, surrounded by loved ones. Her hair was styled and each strand perfectly placed. At 5 p.m., shimmery eye shadow was set and blush applied to her rosy cheeks. By 6 p.m., Padgett was departing her dressing room to walk the dirt trail that led to her waiting family and friends. Kneep said in a telephone interview that the photo shoot was both heartbreaking and remarkable -- fraught with mixed emotions: joy for the couple’s love and sadness for its abrupt and tragic conclusion. Kneep said photography is far more than a photo. It is memories that will last a lifetime. It was a powerful but painful day for the two families, and Kneep wanted to do something special for the brave young bride. She hit upon an idea: superimpose Murphy’s image beside his bride. Kneep said she wanted to surprise Padgett, given all she’s been through. Jessica Padgett at Glendale State Park, Sept. 29, 2018. “She was so grateful for the [superimposed] photo and said people need to see this,” Kneep said. When all was said and done, Padgett knew she had made the right choice.